fligh63 has no other items for sale. Exactly as stated. Fast shipping. Great price. Happy with purchase. Fast shipping and as advertised. Item as described, Well pleased. Thank You! Highly recommend Seller. 5 Stars! Hands pretty bent, but works fine. 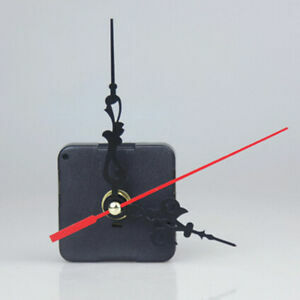 I ordered this item to replace the works on one of my quartz clocks. I thought these things were pretty much universal. WRONG! When it arrived, the foil-thin hands were bent double and needed straightening. The hole in the hour hand was slightly too small to fit over the shaft and required some bending to make it fit. Then, when I attached the minute and second hands the hour hand worked loose and I had to remove the two others. The peg on the second hand broke off in the process. Just threw away three bucks. Funny thing was, I tinkered with the one I was replacing and got it to work again. Don't bother with this item. I gave it two stars because at least the mechanism worked. The clocks ok the hands. Came all bent up due to the poor packaging,.and the second hand would not fit on it.there should be a tool to install the hands.u can buy the same clock from China for .99.ifu don't mind waiting 3-4 weeks for it. It runs for 2 to 3 days then stops. I tap one glass and it will restart for another couple days. The hands are not rubbing against each other, I have carefully checked this. I have tried at least 3 batteries. I found the clock shaft to be way to short so I was unable to use it with my project. You would have to use it with a very thin face - less than 1/8 of an inch. A smooth moving mechanism that keeps great time and fits in most places. Great for that old clock that's to nice to throw out why not breath new life into it. Delicate and cheaply made but aren't they all. Otherwise a very good buy.